Readers of the Archives and Manuscripts blog will have noted that the internet has been invaluable in helping to discover anonymous authors of diaries in the Bodleian, both recently acquired items (see Search and Searchability), and manuscripts that have been in the library for more than 250 years (see Discovered! A ‘lost’ diary of Sir Edmund Warcup). 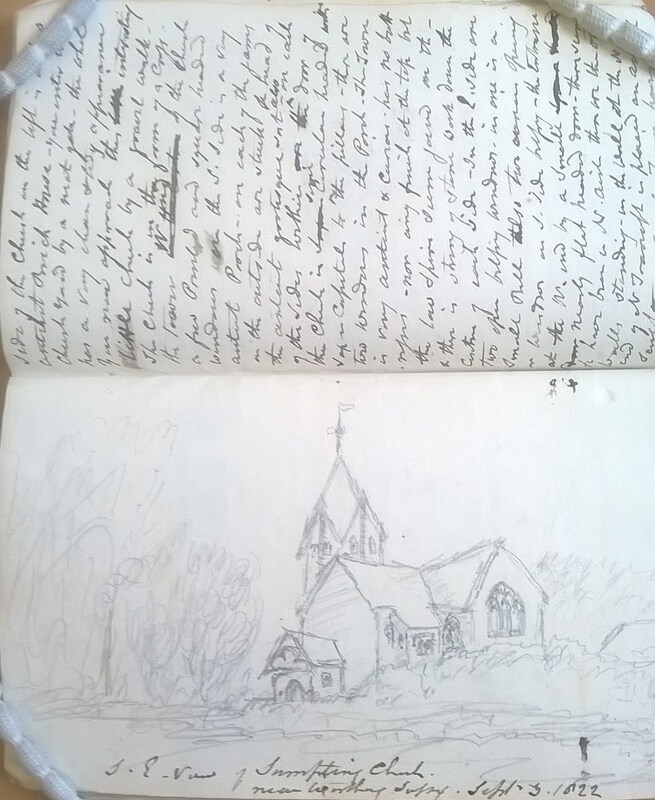 This latest discovery relates to a diary purchased in 1921. 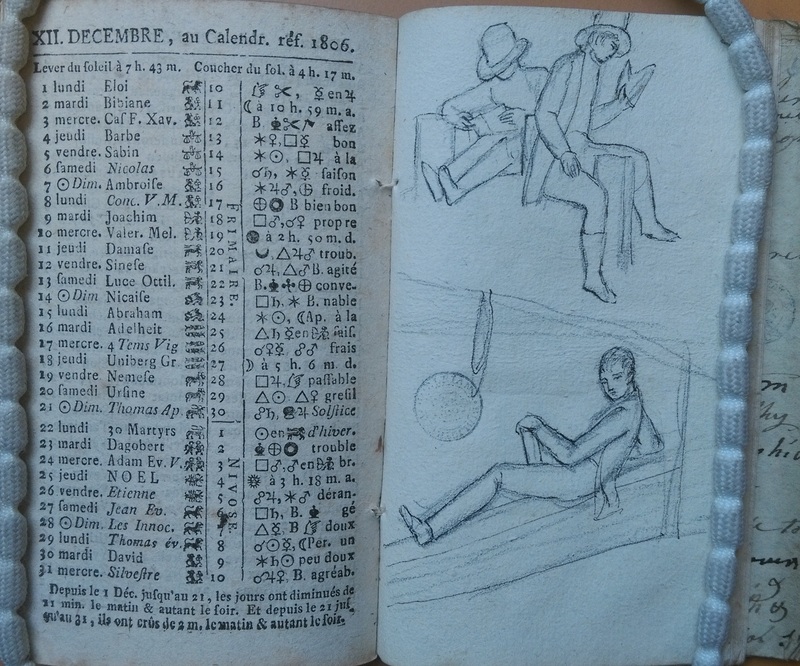 45961 Diary of a continental tour, in the Almanach de Lausanne, 1806, with a (fols. 34-5) sketches and b (fols. 51-8) a diary for 1805. iv + 60 leaves. This rather unhelpful description immediately caught my eye. 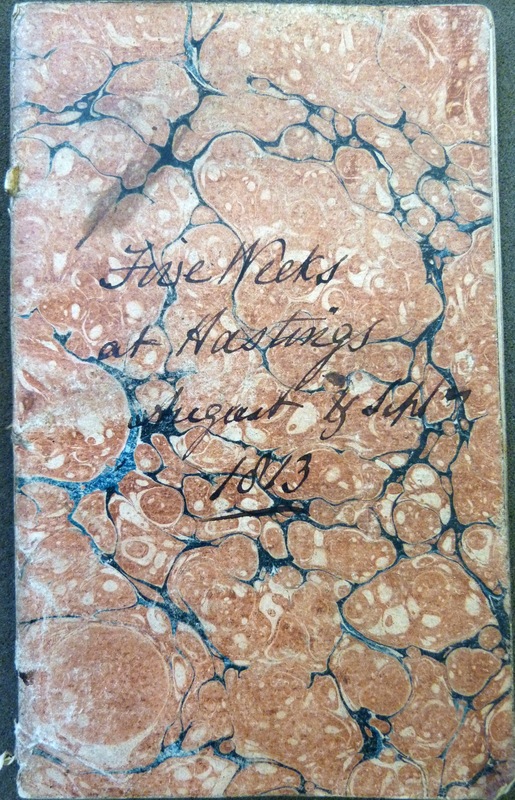 I was intending to use this intriguing diary as one of the manuscripts to investigate in a workshop held in the Bodleian in 2015 when students were invited to see if it would be possible to supply authors to a group of anonymous travel diaries using internet resources (Travelling Incognito workshop). However, it is a fairly fragile item and it was deemed unsuitable for the workshop. There are some oddities about this diary. Most obviously, a simple ‘continental tour’ is not something that would have been lightly undertaken in 1806. Most British travel diaries in this wartime era either date from 1802, during the brief peace of Amiens, 1814, after Napoleon’s first defeat and exile to Elba, and 1815 after his final defeat at Waterloo. Why would anyone be travelling in 1805-6, at the height of the Napoleonic Wars? Napoleon defeated the Russians and Austrians at Austerlitz in October 1805, and the Prussians at Jena and Auerstadt in October 1806. So our diarist seems to have chosen a war zone for a tourist destination – indeed, the earlier part of the diary includes a stay in Weimar. In 1804 Duke Charles Augustus of Saxe-Weimar married his son to the sister of Alexander I of Russia, and then joined the Prussians in their war with Napoleon. As a consequence of the defeat of the allied coalition, the Duke had to join the Confederation of the Rhine, Napoleon’s new German order following his abolition of the Holy Roman Empire in 1806. All in all, not a good time to be a British tourist in Germany. My first thought was that some mistake had been made. The diary is written in a printed almanac of 1806 – perhaps the manuscript diary was written a few years later? A brief perusal of the short diary soon put me right. The 1805 diary at the end of the volume is clearly headed as such, and the author was in Weimar at this date. There are no substantial entries between February and 20 June, at which date the diarist left Weimar, heading for Gotha then Eisenach, Fulda, Frankfurt and Wilhelmsbad, where the author notes, ‘an alarm on account of the French’, September 1805. By the last entry in this section, Basle has been reached. This section of the manuscript is on a gathering of leaves sown into the binding of the printed almanac towards the end. It is necessary to return to the beginning of the volume to continue the story, which begins 1 January (no year) when the diarist was given a gown as a New Year gift by ‘Mr Hare’. So it was reasonable to assume that the diarist was a woman. What, then, was the relationship to Mr Hare, and what were they doing abroad in 1805-6? That they were still on the continent in 1806 was apparent from further entries. On 6 January the diarist attended a ball where she ‘danced only once, & with the Prince of Mecklenbourg’, presumably the Prince of Mecklenburg who visited Madame de Staël in Coppet, Switzerland, in 1805 . On the same page she noted ‘finish’d the portrait of Mr H’ which sounds formal enough to suggest that she was something of an artist. 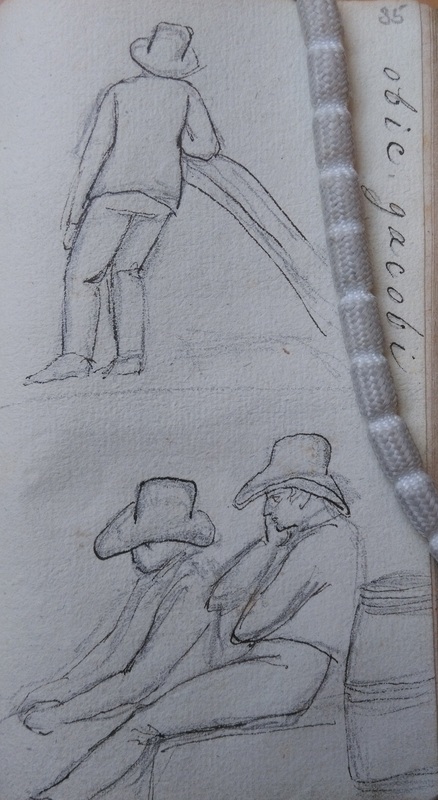 As the catalogue entry notes, there are indeed a few sketches in the diary. This was crucial information. Entering the words Hare died Lausanne April 1806 into a search engine produced remarkable results. Among these was a Wikipedia entry for Francis Hare-Naylor, which included the information that ‘on Easter Sunday, 1806, Georgiana Hare-Naylor (his wife) died at Lausanne, leaving her children to the care of Lady Jones (her eldest sister). The Handbook of Dates confirms that Easter that year was indeed 6 April. Georgiana was the cousin of her more famous namesake, Georgiana, Duchess of Devonshire. “pass’d through a number of French troops, always civil”. 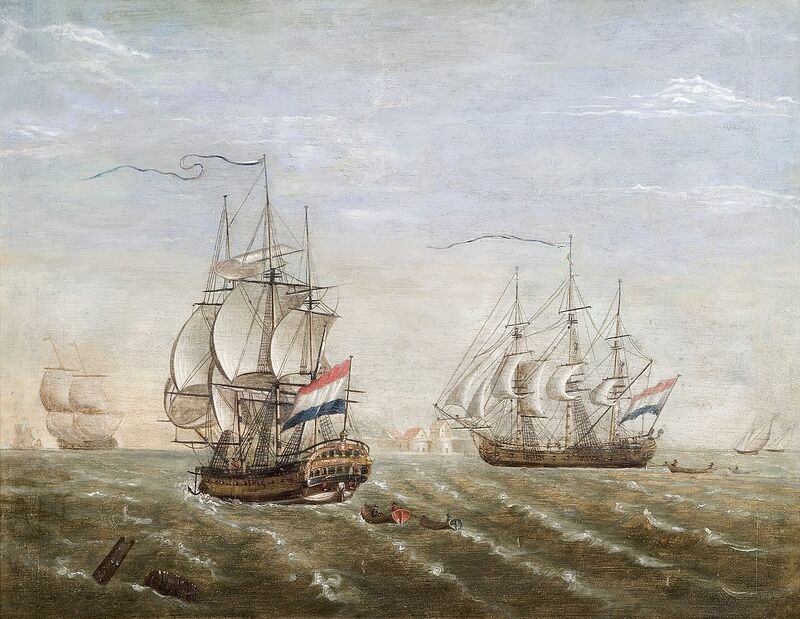 By the end of 1806 their journey had taken them to Hamburg, and by 23 July they had landed at Gravesend. 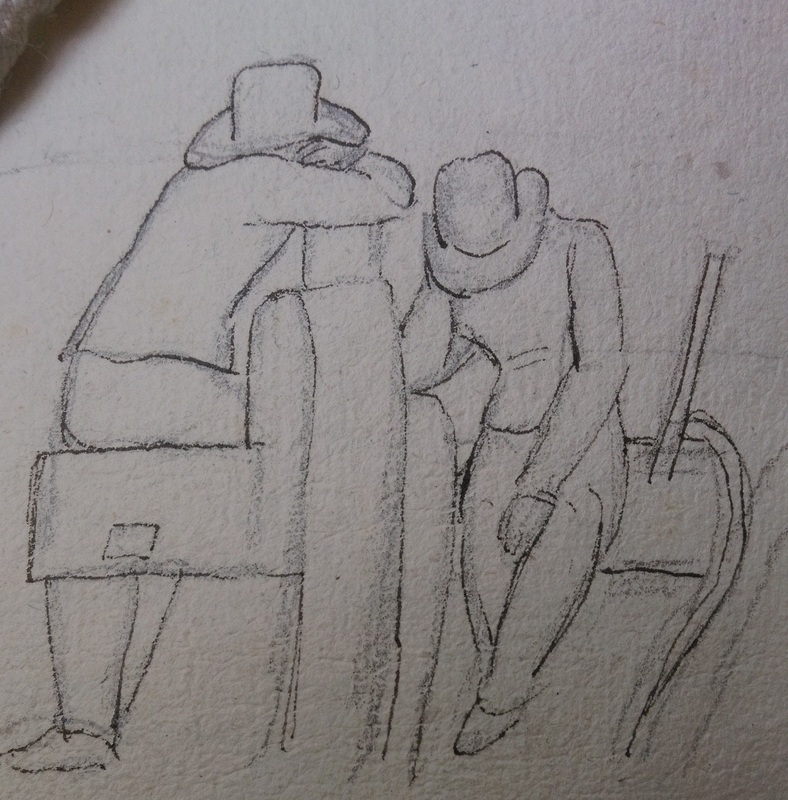 It appears that the sketches in the diary might have been done on this voyage: there is a view of the English coast (probably Orford Ness – my thanks to Sumner Braund for helping to identify this), and a number of figures who appear to be lounging on or below deck. Could they be rather bored young Hares? Sketches and paintings by Mary Ann Flaxman are held in various repositories, and some of her letters are in the British Library. 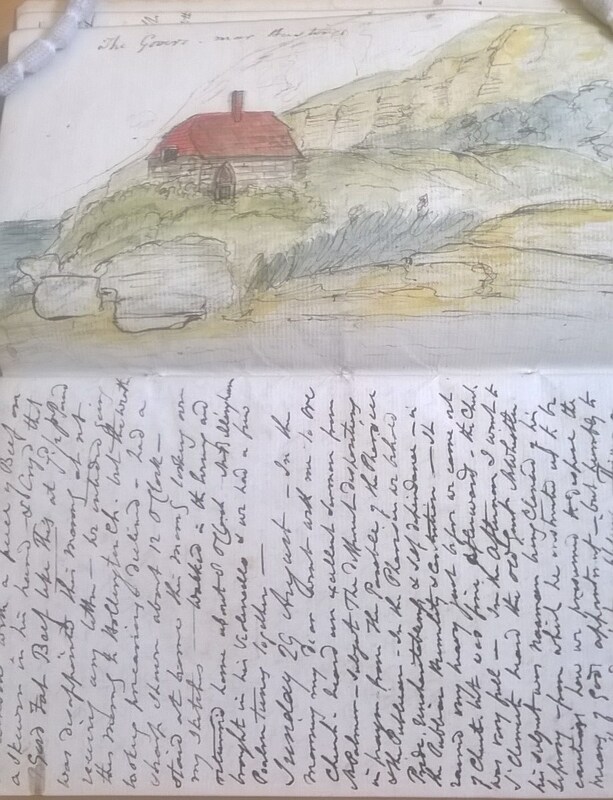 All that remained for me to do to complete the reattribution of the diary was to see if the handwriting of her letters and the style of her sketches matched what was in front of me. 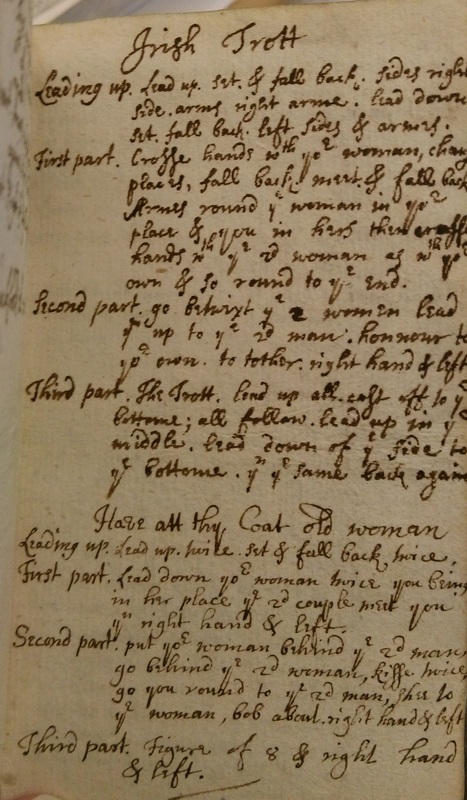 Claire Wotherspoon of the British Library very kindly supplied me with scans of some of Mary’s letters in Add MS 39782, and I can confirm that the handwriting matches that of the diary. 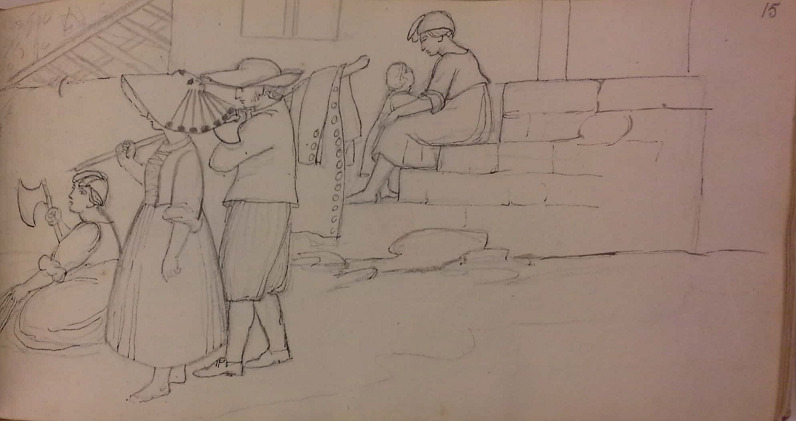 There are also sketches by Mary Ann Flaxman in the same collection. 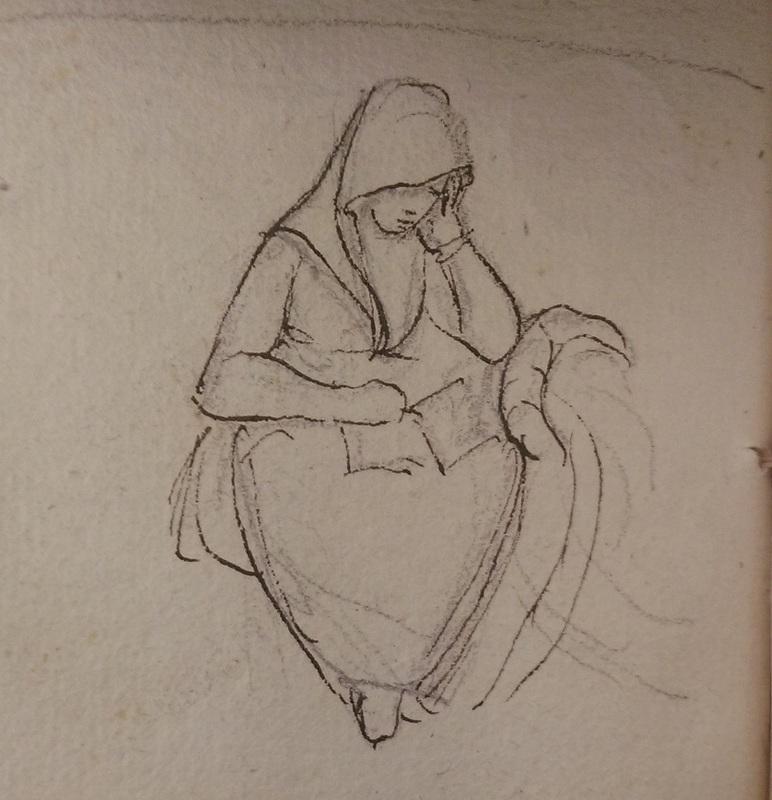 To my untrained eye at least, there is nothing in the sketch below that makes me think that Mary was NOT the creator of the sketches in the diary reproduced above. The diary is now being recatalogued. Visitors to the Jane Austen exhibition (Which Jane Austen?) will have seen a small diary whose anonymous author attended a party in Paris where both Jane Austen’s aunt and cousin were present. What are we to make of this? At first I was struck by the author’s apparent interest in India. 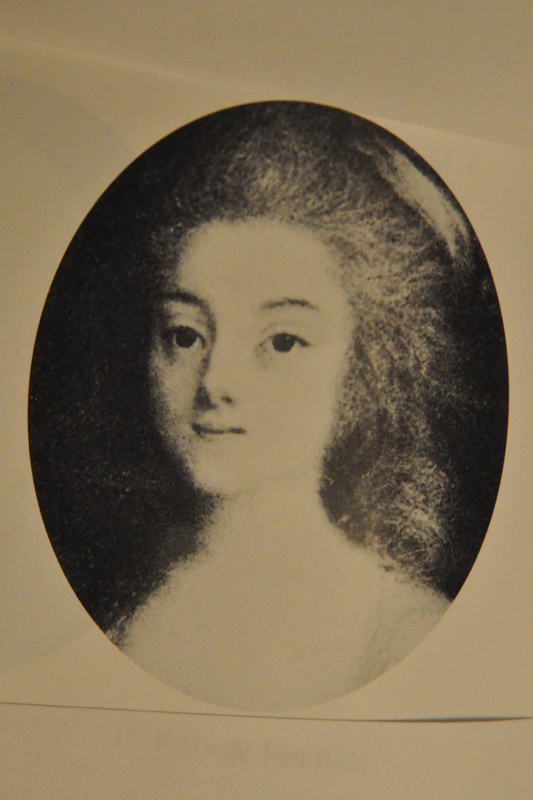 The fact that Madame Hancock had been ‘en des Indes’, and had known various people out there, was clearly of interest to the author who may well have had connections with India and the East India Company, and appears to have had mutual acquaintances there with Mrs Hancock. The name of the host, Pattle, was sufficiently unusual to be worth an internet search, so I tried my luck and put the names Pattle, Hancock, Sumner, Yorke and Birch into a search engine together with India. The results were encouraging. One ‘hit’ was on a document created by the British Library, People and Places. A guide to materials relating to India at the British Library Western Manuscripts Collections. This guide revealed that one Thomas Pattle had been a director of the East India Company; that Richard Sumner was also an East India Company official, and that Warren Hastings, as Governor-General of India, had corresponded with him. The names Yorke and Birch are also listed in an Indian context, but the name that really stood out was that of ‘Tisoe Saul Hancock’, Surgeon at Fort William (Bengal), especially as his name came up in the context of letters he had written to Warren Hastings. Also mentioned in the British Library Guide was ‘Mrs Hancock’. 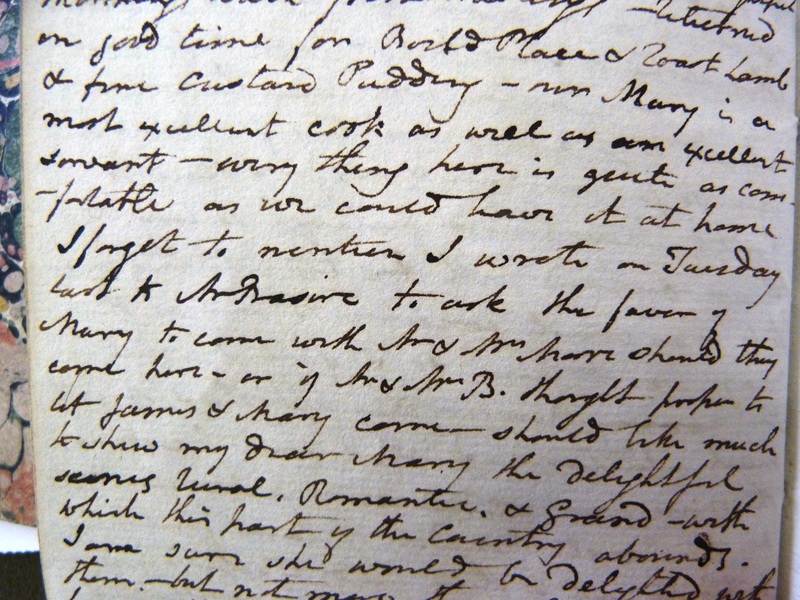 Copies of Mr Hancock’s letters to his wife and daughter, and his will, are among the papers of Sir Warren Hastings. The significance of all this is that Tysoe Hancock’s wife was Philadelphia Hancock, nee Austen. She was Jane Austen’s aunt. So now let us return to the dinner at Mr Pattle’s house in Paris in June 1786. Those knowledgeable about the history of Jane Austen’s family will have noted straightaway that the ‘fille’ of Mrs Hancock, also present at the dinner, must be Eliza. And of course, Eliza and her mother were in France in 1786 because Eliza had married a French Army Captain, Jean-François Capot de Feuillide. Jean-François made the mistake of making (possibly bogus) claims to aristocracy and ended up a victim of the guillotine, by which time the Hancocks had returned to England. Eliza was thus Jane Austen’s cousin, and Jane knew her well. She was 14 years older than Jane, and according to the article on Jane in the Oxford Dictionary of National Biography, Eliza was ‘a frequent visitor to Steventon and a powerful influence on her cousins.’ Her vivacious and witty nature is thought to be reflected in the character of Mary Crawford in Mansfield Park, published shortly after Eliza’s death in 1813. By then, Eliza had married Jane’s brother Henry, so that she was Jane’s sister-in-law as well as her first cousin. The most interesting thing about the passage mentioning the dinner in Paris is the apparent reference to a story circulating at the time, that Eliza was the natural daughter of Warren Hastings (stated in the rather bald French, ‘sa fille etait de Mons r Hastings’). Whatever the truth or otherwise of the rumours surrounding her birth, and this subject remains controversial among Austen scholars, it is very interesting to see that the story was apparently circulating in Paris in 1786, even among those very close to Mrs Hancock and her daughter. None of this has helped us to identify the author of MS. Eng. misc. e. 250, but it does suggest a network that might be pursued. 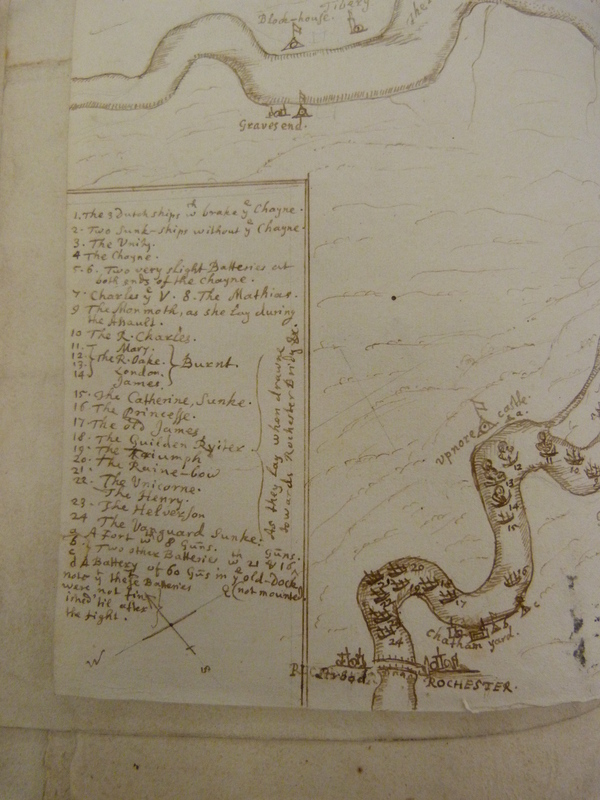 And during the course of the Travelling Incognito workshop, the student assigned to work on this diary discovered that the author had visited Mr Pattle on 13 June. His house was in Place Royale, and the author delivered to him ‘our letters and parcels’, one of which was from Mr Hastings, thanking Mr Pattle for his offer of his services ‘on the trial’. So it certainly would appear that there is some connection between the author and Warren Hastings, and that perhaps some official business took him to Mr Pattle’s house. 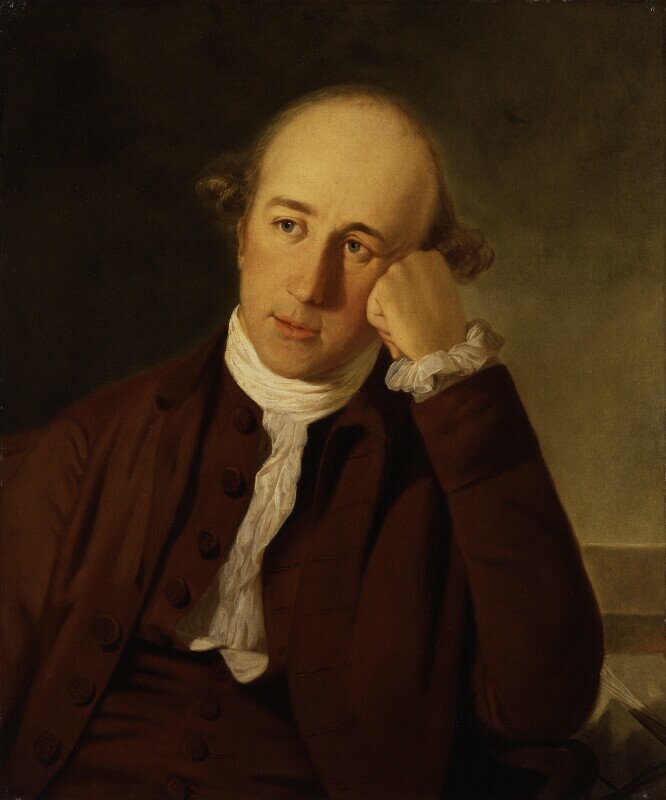 Warren Hastings’s impeachment for alleged corruption in India began in 1787 and he was acquitted after a trial that lasted until 1795. It was during this first visit that Mr Pattle invited the author to dine on the 17th. He describes Mr Pattle as a 76-year-old man with one eye. This identifies Mr Pattle as Thomas Pattle of Paris, whose will of 1788 is among the Prerogative Court of Canterbury records held at the National Archives. Mrs Maria Villette, presumably the Madame Villette noted in the diary, was a major beneficiary, in recognition of the care she had taken of Pattle and his affairs. Julia Margaret Cameron, nee Pattle, the noted photographer and great aunt of Virginia Woolf, was Thomas Pattle’s great granddaughter. It may not be significant, but it was a ‘Dr Geary’ who confided to the anonymous diarist the story of Eliza Hancock’s alleged origins. 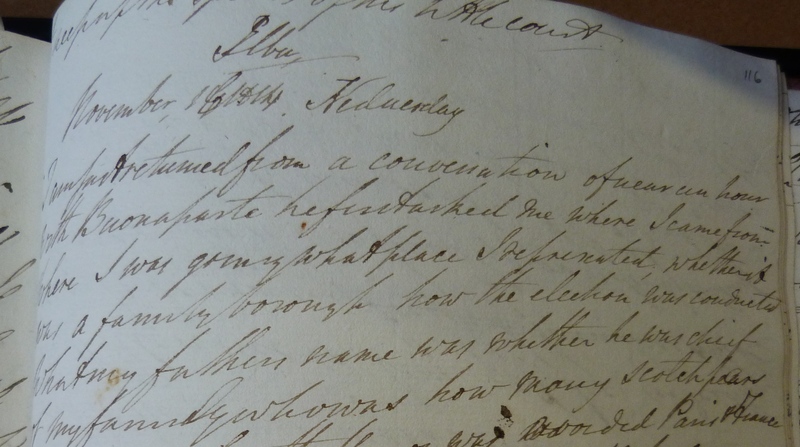 The editors of the Bentham correspondence were not able to identify Dr Keary. Could our diarist have mispelt his name? The editors did have something to say about Thomas Pattle however, noting that Samuel Bentham, Jeremy’s brother, had stayed with a Mr Pattle at Paris in 1775. This brings us once more into the Jane Austen orbit, for she had connections with the Cravens through her great friend Martha Lloyd, and through Thomas Fowle who was betrothed to Jane’s sister Cassandra before his untimely death in the West Indies, both of whom were descended from a junior branch of the Craven family. The Countess Craven in Jane’s day, daughter in-law- of the Lady Craven mentioned by Bentham, read and offered her opinions of some of Jane Austen’s novels, as indeed did Warren Hastings (see footnotes in the The Letters of Jane Austen published by OUP, 1995; online database version published by InteLex Corp., Charlottesville, 2004). The diary remains on display in the Which Jane Austen? exhibition in the Weston Library until 29 October. One of the joys of the Bodleian’s collections is that they are so rich and complex that there are still discoveries to be made, even among collections that have been here for 200 years or more. The sheer scale of the great and ongoing task of making the collections intelligible and available to researchers means that inevitably in attempting to cover broad areas, some individual items are missed. Almanacs appear to be a case in point. 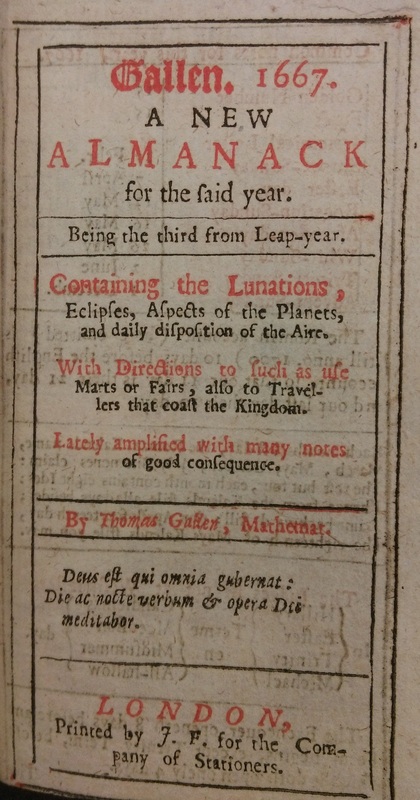 While 17th-century almanacs can be found via SOLO, they are quite often only briefly described. But a number of them are unique items, containing manuscript memoranda, accounts and even diary entries. 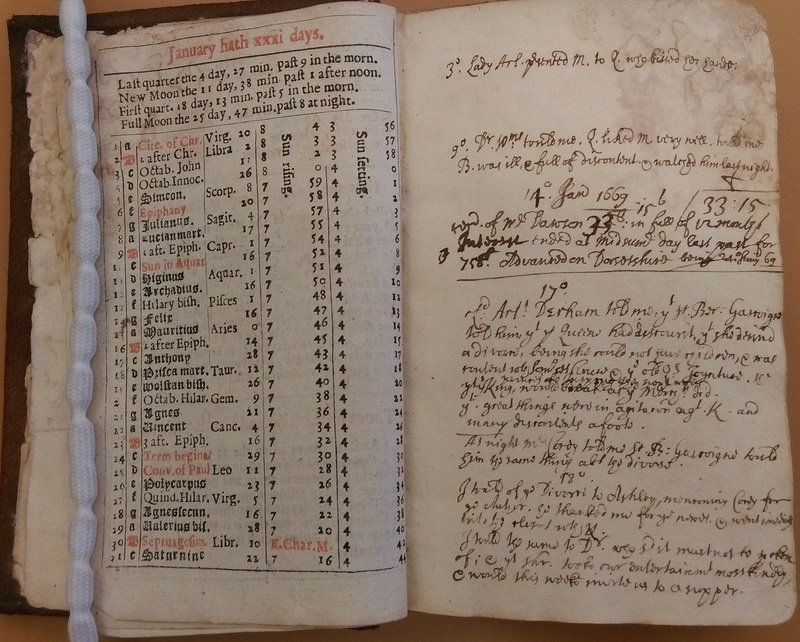 I have found an interesting late-17th century diary in the course of researching our collections of Gallen almanacs, as we have recently purchased a Gallen almanac of 1667 which contains a very interesting diary indeed – look out for news of this in the near future. There are a number of almanacs in the Rawlinson collection, that vast and miscelleneous treasure house of books and manuscripts bequeathed by Richard Rawlinson in 1755. Many of these are in a separate sequence, shelmarked Rawl. Alm. 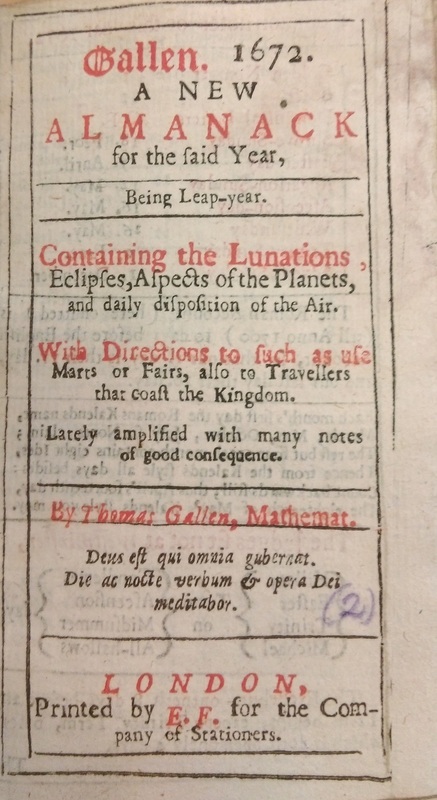 Five almanacs bound together, including a 1672 Gallen almanac, have the shelfmark [Octavo] Rawl. 439. However, though SOLO does not record the fact, if these five little almanacs began life as printed books, they are no longer, because their owner kept his diary in them between 1670 and 1674. My attention was first drawn by the bold signature of one R. Warcup on one of the pages. Warcup was a name known to me. Sir Edmund Warcup (or Warcupp) was a lawyer and magistrate who makes it into the pages of the Dictionary of National Biography largely on account of his notoriety as an over-zealous pursuer of papists during the (mostly imaginary) Popish Plot of 1678. Subsequently he realigned himself with the Anglican-Tory interest in the aftermath of the Exclusion Crisis. Some of his papers relating to the interrogation of supposed plotters can be found in the manuscript collections in the Bodleian. 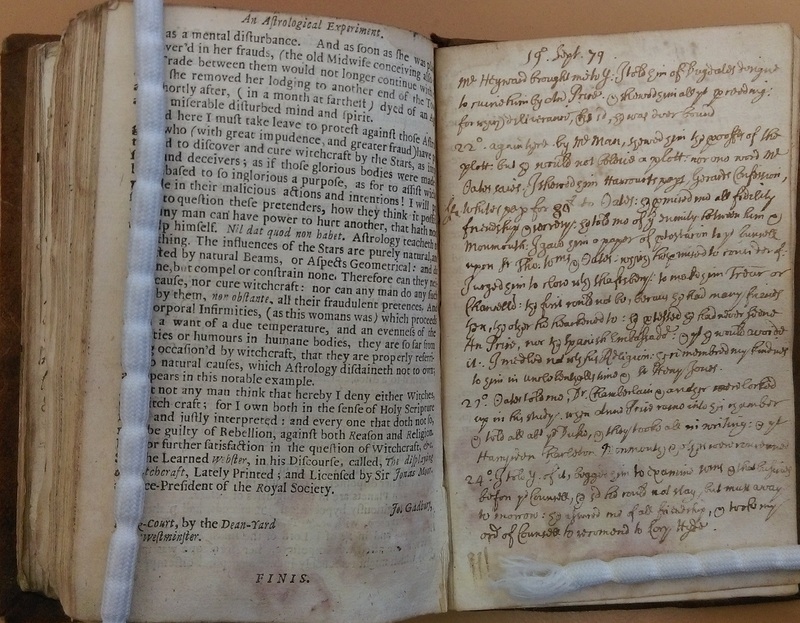 His memorandum book on legal business 1652-1666 is in the Rawlinson collection (MS. Rawl. D. 930), and further miscellaneous papers are in MS. Rawl. D. 384. These papers, acquired as a result of Rawlinson’s bequest of 1755, were supplemented by further papers given to the Library by St. John’s College, Oxford, in 1953, comprising largely depositions taken before Warcup about the Popish and Presbyterian plots, 1678-82 (MS. Eng. hist. b. 204). So my first thought on seeing the signature of R. Warcup was that this almanac might in some way be connected with Sir Edmund. A closer inspection revealed firstly, that the signatures (there are more than one) were in a different hand from the rest of the manuscript notes; secondly, a Robert Warcup is mentioned in the text as ‘brother’; and thirdly, the notes were partly a diary and partly memoranda, and the diary begins in January 1670 (New Style) with an account of rumours circulating at Court about the Queen’s wish to divorce Charles II and retire to Ham House. The diarist seems to have been active in spreading the gossip about, until one of his confidants went straight to the King and the diarist was told never to speak of the matter again! Internal evidence suggested that the diarist might be Sir Edmund Warcup himself, particularly the several references to Northmoor, Oxfordshire, his country seat. The DNB article mentions a diary of 1676-1684, edited and published by K. G. Feiling and F. R. D. Needham in the English Historical Review in 1925. 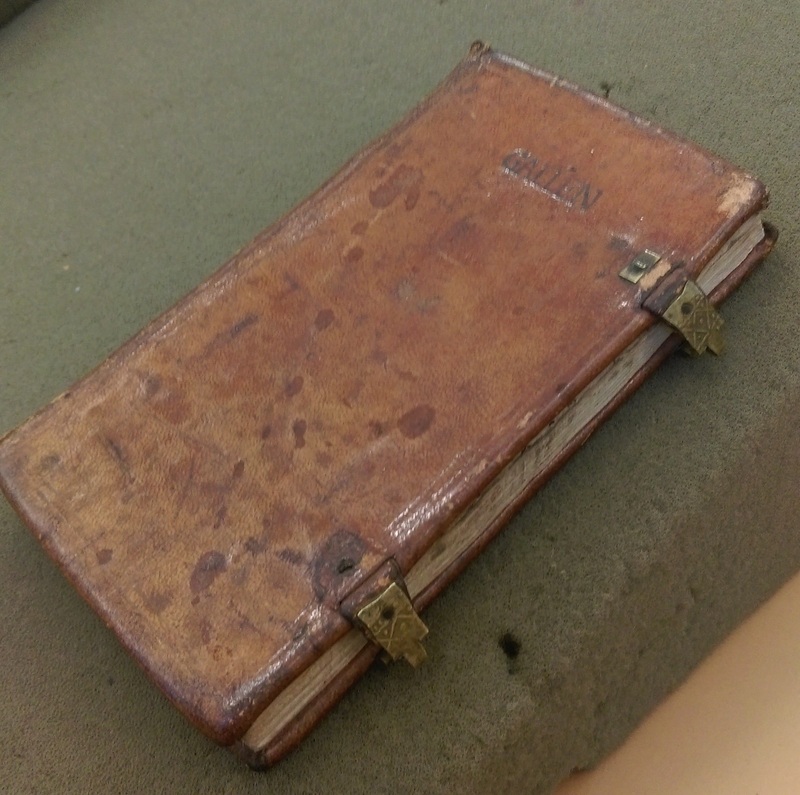 Much to my surprise, this diary turned out to be in the Bodleian. The editors stated in their 1925 article that ‘certain journals of this Edmund Warcup, hitherto, it is believed, imprinted, have lately been discovered in the Bodleian Library’. They are in fact among the Rawlinson Almanac collection and have the shelfmarks Rawl. Alm. 201-203, though I have found no trace of a catalogue of these discoveries either in SOLO or in the Printed Books with MS Additions catalogue. There are two volumes of a diary 1676-1684, and a further volume comprising little more than brief memoranda 1708-11. So although these diaries were discovered in 1925, and the edition by Feiling and Needham has been cited by scholars of Restoration history ever since, the original diaries have remained as nothing more than printed almanacs in our own catalogues. 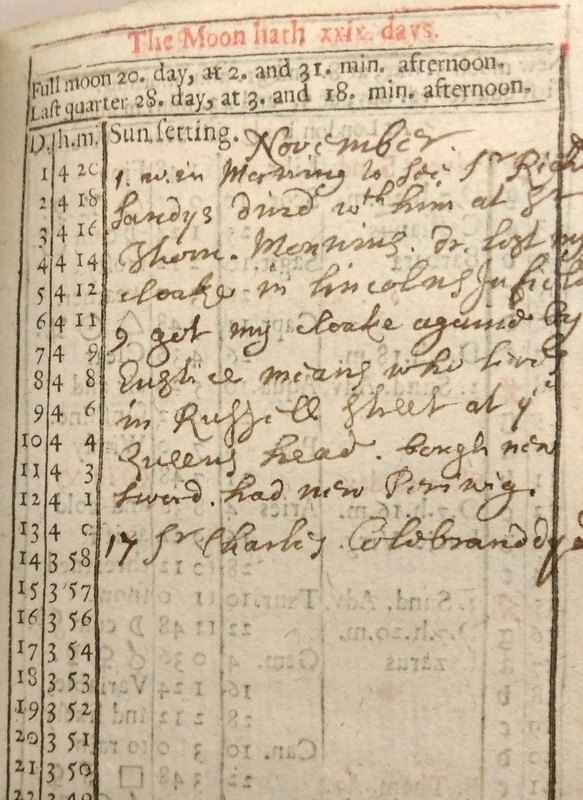 And the annotated almanacs I have discovered take Warcup’s diary back to 1670. Feiling and Needham missed it for one simple reason – it is not in the Rawlinson almanac series. The 1670-1674 diary was for some reason now unfathomable, given the shelfmark [Octavo] Rawl 439. Presumably at some early stage in its life, it became separated from the others. 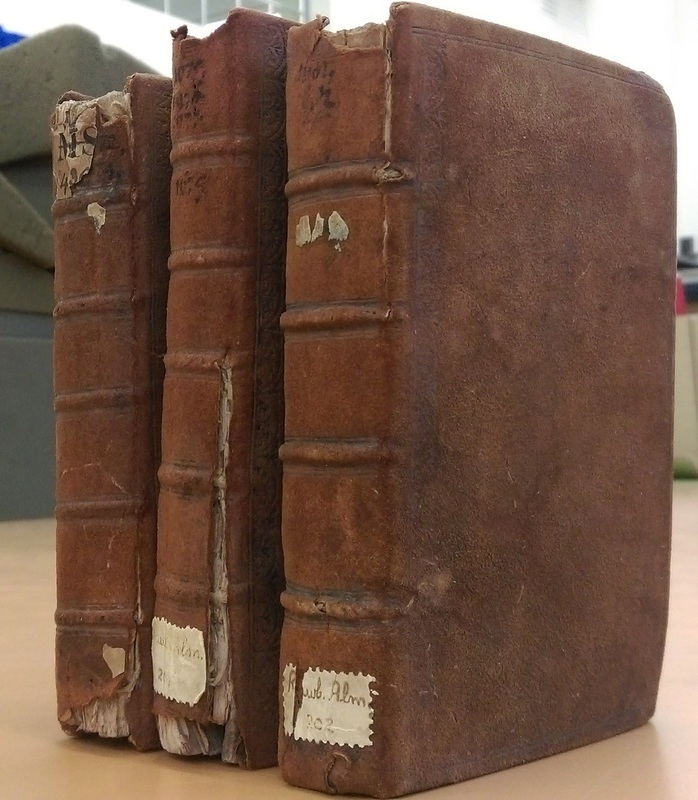 Three volumes of Warcup’s diary. The two to the right unearthed in 1925, the one on the left in 2016. Acquired 1755. Feiling and Needham’s edition provided all the remaining evidence needed to be sure it was Sir Edmund’s diary I was looking at. 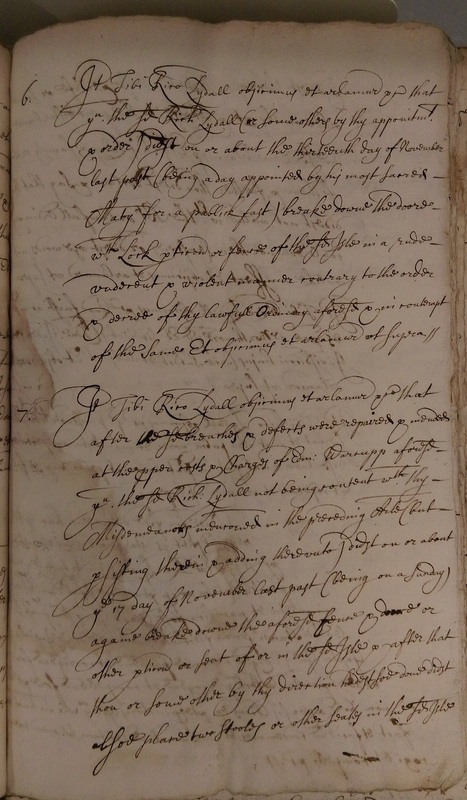 The introduction in the EHR article mentions that Warcup, after a spell out of favour occasioned by his over-free use of Arlington’s name ‘to cover some financial transactions of his own … resumed in 1667 a long career as farmer of the excise for Wiltshire and Dorset, again became a justice, and added a commissionership in wine licences.’ Part of the newly discovered diary is indeed a ‘Journall into the West in anno 1673 about the wyne lycences’; and Arlington is mentioned very early in the diary when Warcup notes that on 3 January 1670 ‘Lady Arl[ington] presented M. to Q. who kissed her hande’. Q. is clearly the Queen, and M. is harder to fathom, but might be the Duke of Monmouth (see below). Any remaining doubts about authorship were dispelled as soon as I compared the diary with the ones discovered in 1925. The binding, handwriting and even historic damp damage were alike in all the volumes. There were even memoranda cross-referenced from the ‘new’ volume to the others. 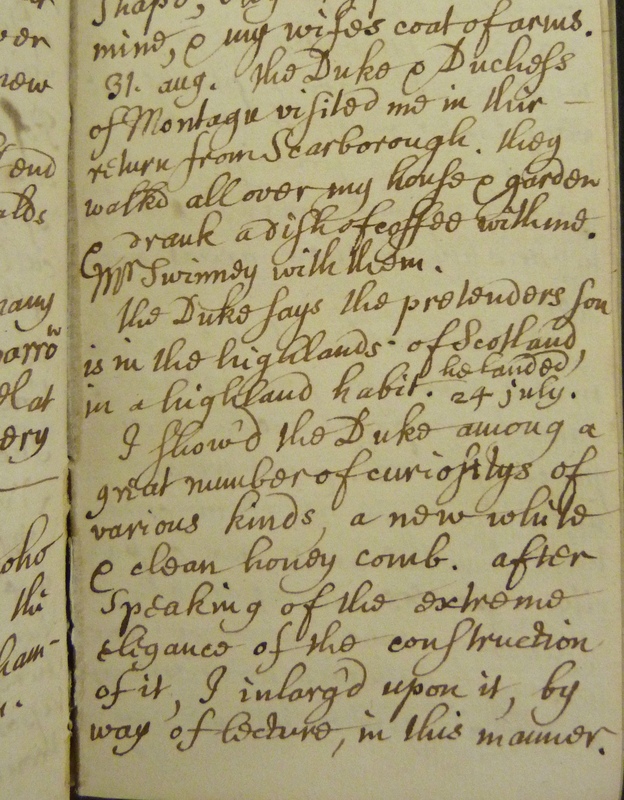 Entry from Warcup’s 1679 diary in Rawl. Alm. 201. Warcup is exasperated at the scepticism shown towards evidence of a Popish Plot offered by the notorious Titus Oates whom Warcup was all too ready to believe. 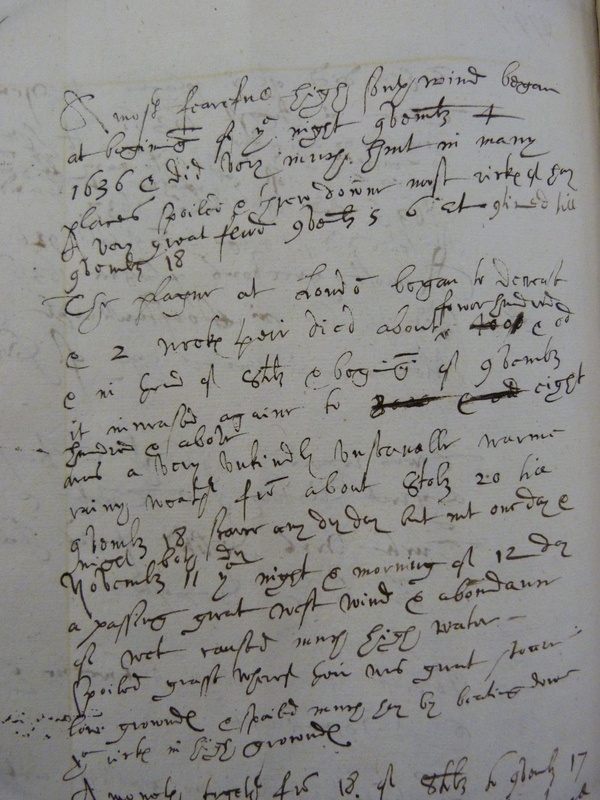 Warcup’s later diaries have long been established, thanks to Feiling and Needham’s extracts, as a major source for proceedings in the Popish Plot. Although the recently discovered diary covers a perhaps less interesting phase of Warcup’s career, it is nevertheless a valuable document. It contains a mixture of London and Oxfordshire entries. Warcup’s career began in London where he was he was a JP, and he had connections with Shaftesbury, the Chancellor of the Exchequer. “At the Dukes Play house. D.M. led An to her coach. We were at Lincolnes Inn Revels. M. there spoke to us, & at 7 next morne, Prince of Orange, Mon. & Ld Rochester came & danced & caused Pitts & his son fidlers to play before our doore, and threatned to fire Pitts his house. 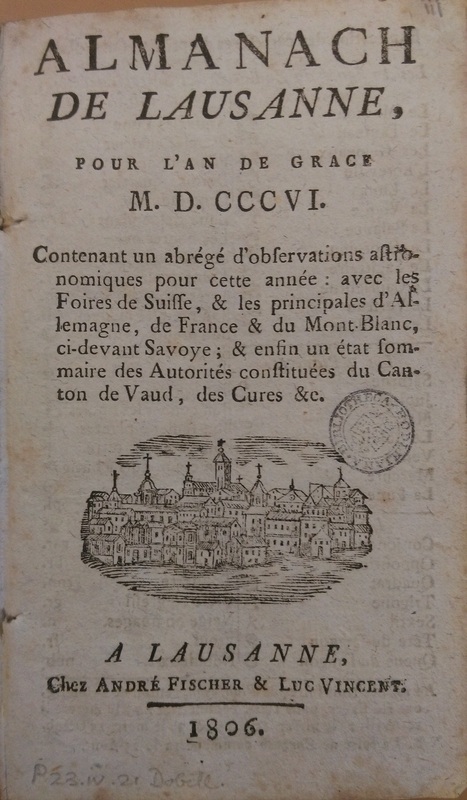 As already mentioned, there is a 1673 West Country diary which describes the process of selling rights to trade in wine to various merchants in Bath, Bristol and other West Country towns. Otherwise, much of the diary is taken up with Oxfordshire matters. 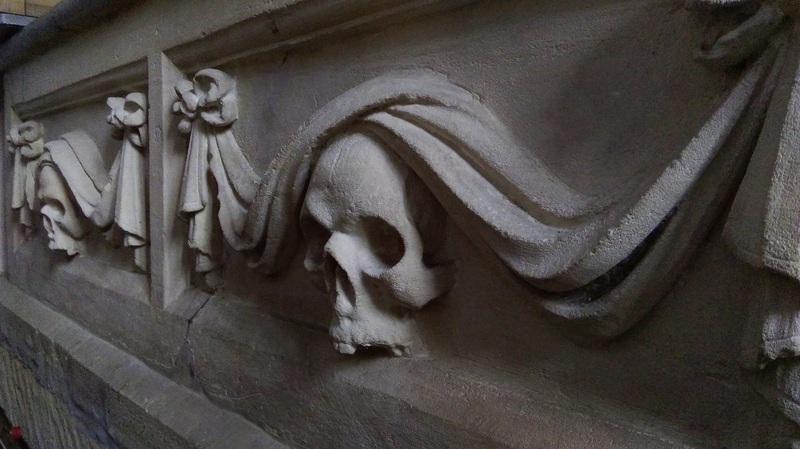 The memorial to Sir Edmund Warcup, who died in 1712, is in the church at Northmoor, Oxfordshire. I made a visit on Boxing Day intending to take a photograph of his monument for this blog post, but unfortunately the parish has not managed to resist the temptation to use Warcup’s rather fine monument as a table, and I found it piled high with kneelers, parish newsletters and other bits and pieces. 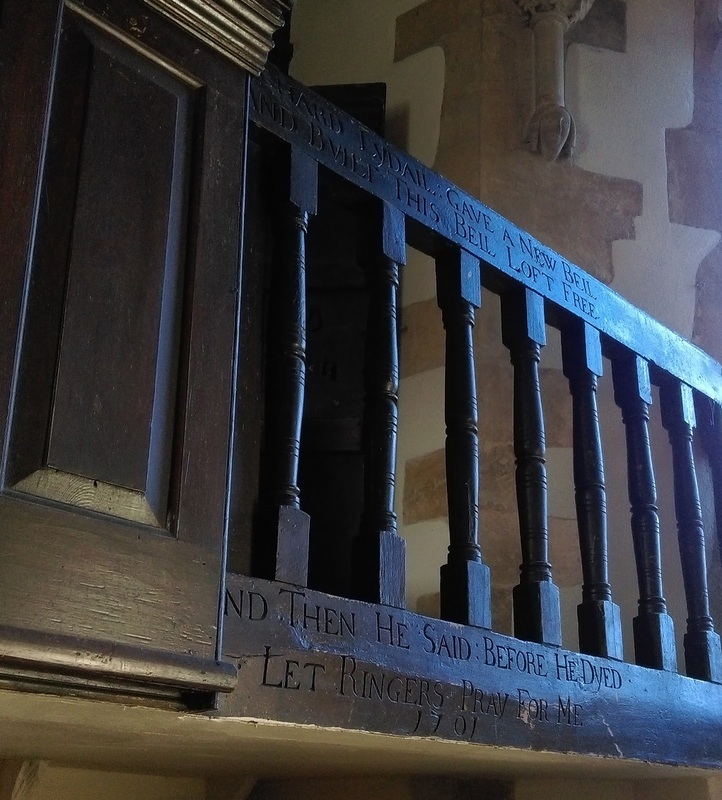 It seems that Edmund Warcup has not only been neglected by the Bodleian! I carefully moved a large and heavy folding table leaning up against one side to take a picture of the rich stonework. “he & Mr Martin were at Westchester the last Whitsuntide when Mrs Martins mounds & the colledges were pulled up”. 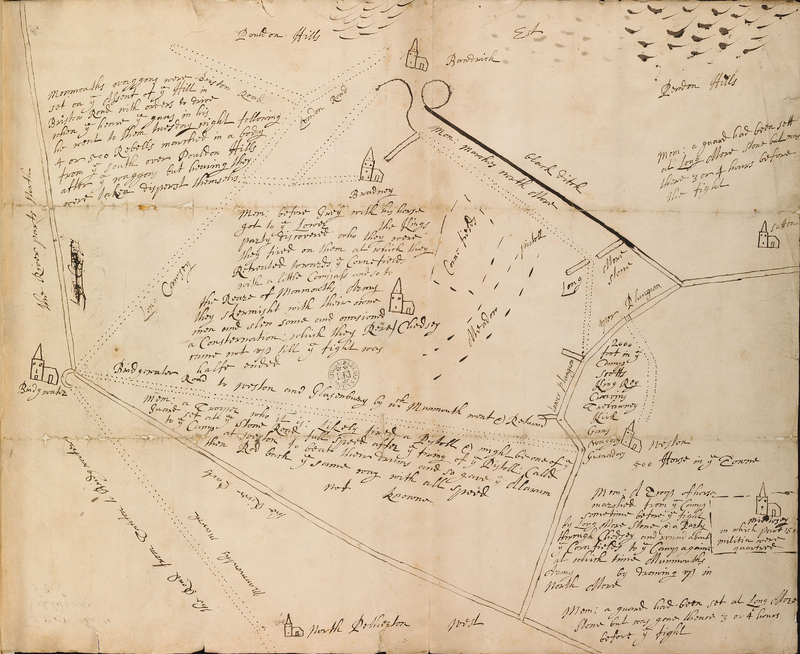 “that he beleived there were 40 foote and 20 horse out at Whitsuntide last when the mounds were pulled up, that he was out with a brome in his hand that night, that hee sawe the 2 libells with the prints of gates over them in the hands of Wm Bedford, Wm Bedwell, & at the parsonage”. Worse still, the libel was shown to many persons, and Mrs Martin’s maid, among others, had read it. The ‘college mounds’ must have belonged to St John’s College, Oxford, landowners in the parish and one of the parties to the decree. It would appear that Warcup was enclosing fields and ran into dispute with his neighbours, and that the libel somehow related to that. The decree is extemely lengthy and lays out the rights and obligations of all parties in the formation and use of the enclosed lands. According to A History of the County of Oxford: Volume 13, Bampton Hundred (Part One), Warcup acquired Northmoor manor in 1671. 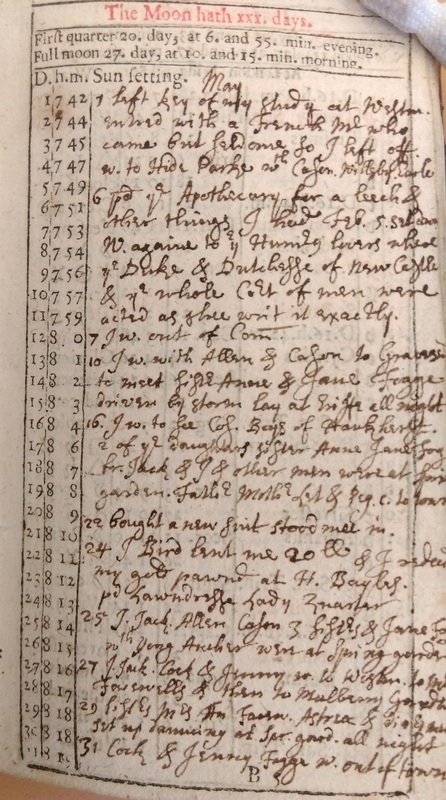 His diary for 1671-1672 is almost entirely taken up with aspects of the Northmoor enclosure, with notes of meetings and accounts of expenditure. The memoranda about the ‘circle libell’ appear at the end of this sequence. 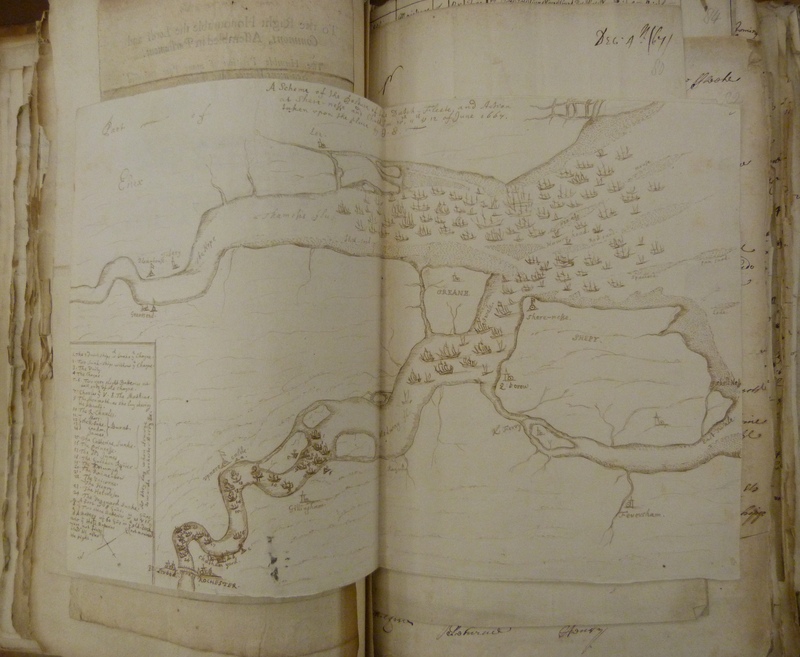 On 5 March 1672 Warcup had noted in the diary that William Bedford admitted having seen the ’round libell’. Have you seen this manuscript? I am clearly not the first person to have seen Warcup’s diary in [octavo] Rawl. 439, but the lack of any record of it in either our printed book or our manuscript catalogues suggests that I am probably the first to have recognised it as such. If anyone has found or used the diary before, or is aware of any citation of it in a book or article, I would be interested to hear from you. 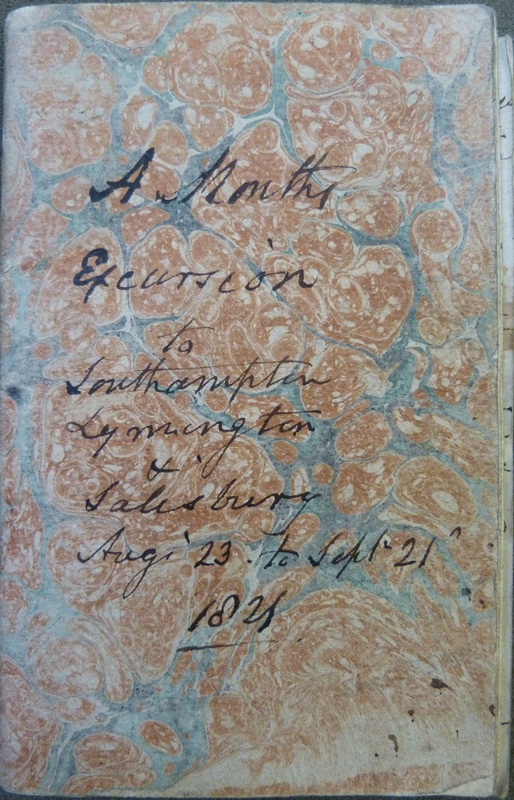 The diaries in question comprise three small volumes, written on three separate excursions to the South coast in the summers of 1813, 1821 and 1822. They were purchased in late 2012 as anonymous holiday diaries. The path to discovery is so convoluted that I thought it would be worth recording the steps by which authorship was established. The story illustrates the power of the Internet, not necessarily in the data it contains (though there is much of great use), but more in its ability to establish links between isolated snippets of information which themselves may lead nowhere, but together provide enough pieces to complete the jigsaw. Before I outline the steps to discovery, I will make a short digression on the subject of Fawcett Road, Southsea. When my grandmother died in 1989 we found her birth certificate among her papers, and discovered that her mother’s maiden name was Lesar. She was born in South Africa, and I was keen to discover who the Lesars were. I knew absolutely nothing about the family, and that is the way it remained for many years. However, as the internet grew and there was more and more family history activity, I found quite a lot of information about the name Lesar. It is a Sephardic Jewish name; or it is a French Huguenot name. Or a German name. Or Croatian perhaps. You can find all these facts out there, but I was getting no nearer to establishing who my Lesars were. I did however find a passenger list recording the voyage of my South African family to England in 1923. The address they gave as their destination was Fawcett Road, Southsea. I searched the Internet for the actual address, and to my astonishment found the exact address on a family history website that linked up many families including my great grandfather’s family from Nottinghamshire.The owner of the website had lost track of my great grandfather and his brother because she was unaware that the reason they disappear from British records is that they had emigrated to South Africa. The Fawcett Road address, however, established that their sister lived in Southsea. From this one piece of information I have reconstructed the family history, established links with a double cousin (the two emigrant brothers married two Lesar sisters in South Africa), and found that the Lesars in the Cape originated with a ship’s boy, Isaac Lesar or Leser, a German in service with the Dutch East India Company, who arrived in Cape Town in 1787. So what has this got to do with our seaside journals? I mention it because the whole process of discovery illustrates the point about what can be done with the tiniest scrap of information when there are means to link it to data elsewhere. So the first thing needed to identify our author was belief that it would be possible and not a complete waste of time. Fortunately the diaries are quite short, and so I set myself to read through them as quickly as possible to pick up any references to names or places that might give the slightest lead. Let me list the scraps of information in the order I found them. i) The author was certainly from London, where he began his coach journey, and appeared to be from Islington. In the 1822 diary he begins by telling us that he wished himself 1000 times back in Pleasant Row – apparently he always began his holidays in a gloomy mood. Pleasant Row was certainly the name of a street in early 19th-century Islington (now Pleasant Place) as I was able to establish from the digitised version of the Victoria County History for Middlesex. ii) The author was on holiday with his wife, whom he refers to as Mrs C. This suggested that his own surname began with C.
iii) The author knew someone by the name of Mr Basire. 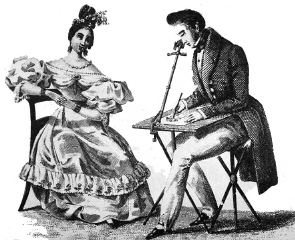 In the 1813 volume he tells us that having gone out sketching with his camera lucida, and dined on duck, he wrote to Basire and Mr Barnett. The combination of the unusual name of Basire and the camera lucida gave me grounds for optimism that he might have something to do with the well- known dynasty of engravers, James Basire, and his son James Basire II. iv) The author received a letter from William Tite to tell him that William’s mother was going to join the author on holiday. William Tite was also sufficiently uncommon a name to try searching, and I immediately found a William Tite born in 1798 who was in the Dictionary of National Biography as a noted architect. This seemed too good to be true. However, I had seen a pencilled note at the end of the 1822 volume which I took to read ‘S Elgar artillery cottage Brighton’. I noticed in the DNB entry for WilliamTite that his mother was one Sarah Elgie, and on returning to the inscription later, realised that it did indeed read ‘Elgie’. But that is jumping a little ahead. v) Mrs Tite joined our author and his wife on holiday. The author, Mrs C and Mrs Tite went for a walk, and the ‘two sisters’ fell twice on the slippery grass. So now I had established a relationship with the Tite family, but I still had no surnames as I hadn’t picked up the significance of the name Elgie at this point. 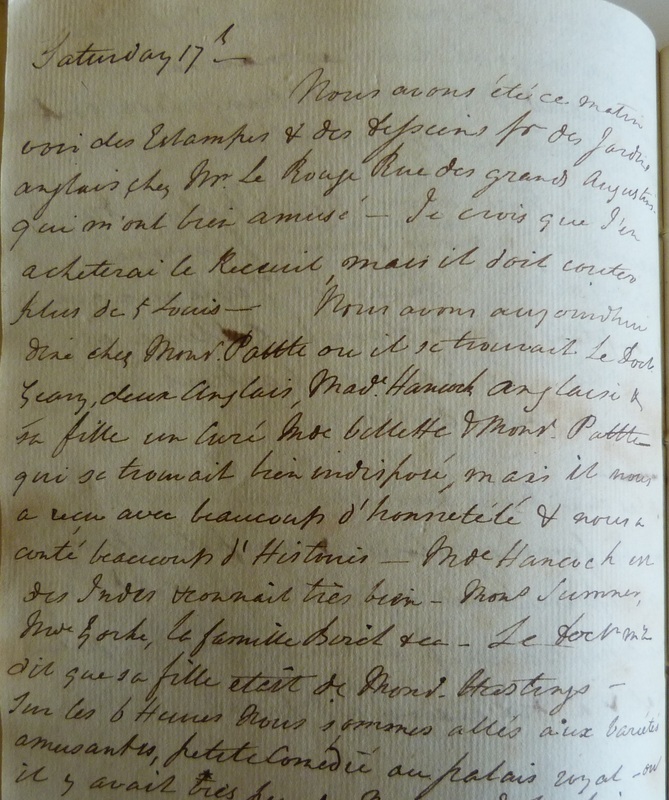 The author also refers to ‘Susan’, and from the context it was apparent that Susan was one and the same as Mrs C.
vi) On 17 August our author records that he received a letter from Mr Basire and another from Benj. Cox. The name Cox interested me given that our author was Mr C. So I searched James Basire together with Cox, and found that James Basire II had married a Mary Cox. Now I returned to the previous entry mentioning Basire and Mr Barnett, and searched Cox, Basire and Barnett. This landed me on Exeter Working Papers in Book History: London 1775-1800 which showed me that Basire, Barnett and Cox were all engravers or printers, and that there was a company Cox, son, and Barnett, copper plate printers, 6, Bream’s Buildings, Chancery Lane. I then contacted Julian Pooley, an expert on John Nichols, editor of the Gentleman’s Magazine, and his family of printers and antiquaries, whose archives are a major source for the study of the book trade. He confirmed that Nichols corresponded with Cox and Barnett, and that the company was employed in producing plates for the Gentleman’s Magazine. vii) The final piece of the jigsaw was established with the author’s entry for 25 August 1813. Having visited a dripping well and eaten a fine custard pudding, he recorded that ‘I wrote on Tuesday last to Mr Basire to ask the favour of Mary to come with Mr and Mrs Moore should they come here – or if Mr and Mrs B thought proper to let James and Mary come – should like much to shew my dear Mary the delightful scenes rural, Romantic & grand …’. This ‘dear Mary’ was clearly intimate with the author; furthermore she was dependent on James Basire, and linked with another James. Surely this must be Mary Cox, wife of James Basire II? And this evidence suggested that the author was most probably her brother. But I still did not know his name. So I tried searching for Susan Cox Islington, and when this proved fruitless, I tried Susannah as I believed I had seen the name so written though I had not noted it. ‘Susannah Cox Islington’ revealed the existence of a will in the Prerogative Court of Canterbury records in the National Archives, dated 1831. To view this required a subscription, but fortunately a colleague’s mother had the necessary memberships, and soon I had the information I needed. To my delight I found that Susannah Cox, widow, lived at 4 Pleasant Row. She left her worldly goods to various Basires and Elgies. She even left a copy of Hannah More’s Practical Piety which Mr Cox mentioned in his diary as his companion on a lonely walk one day. But I still did not know her husband’s name though he was now established as Mr Cox, brother-in-law of James Basire II. 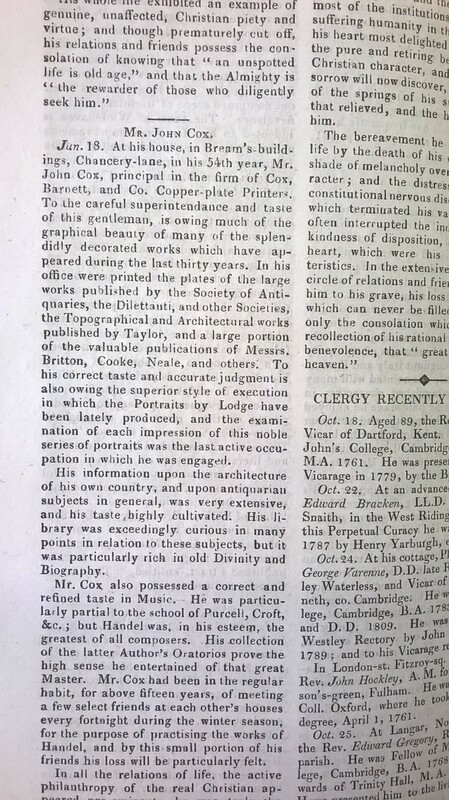 Surely, since I knew now that Mr Cox must have died between 1822 and 1831, it must be possible to find his will too. A search for Cox Islington turned up one or two post-1831 wills. But then I remembered that on one occasion Mr Cox mentions his wife’s birthday, her age and the length of time they had been married, which in 1822 was thirty-one years. 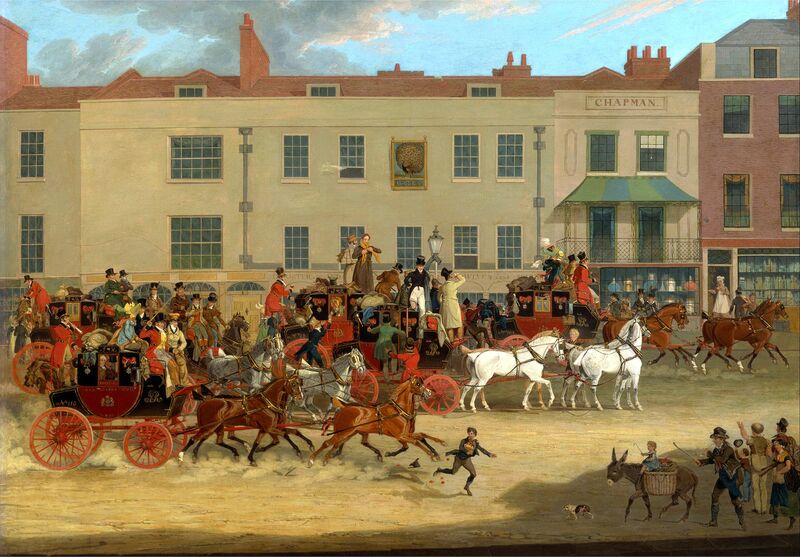 So now I tried a new tack, looking for the marriage of Mr Cox and Susannah Elgie in London in 1791. And quite quickly I found it in a digitised copy of The Register Book of Marriages belonging to the Parish of St George Hanover Square. John Cox married Susannah Elgie on 15 February 1791. With all this information it was now easy to find John Cox’s will in the PCC records. He did not have an Islington address, but instead used his business address – Bream’s Buildings, Chancery Lane, the location of Cox, son and Barnett. His obituary was in the Gentleman’s Magazine of 1825, a rather poignant recollection of the man which fitted well with what I had come to know of him in his short diaries kept in just three summers of his life – his religion, his interest in music, and above all his fascination with medieval churches which he sketched with his camera lucida. The current Bodleian exhibition, Marks of Genius, asks us to consider the meaning and context of the concept of genius. In this 200th anniversary year of the battle of Waterloo, it seems appropriate to kill two birds with one blog, and consider a contemporary attitude to Napoleon whom many, even his opponents, regarded as a genius. 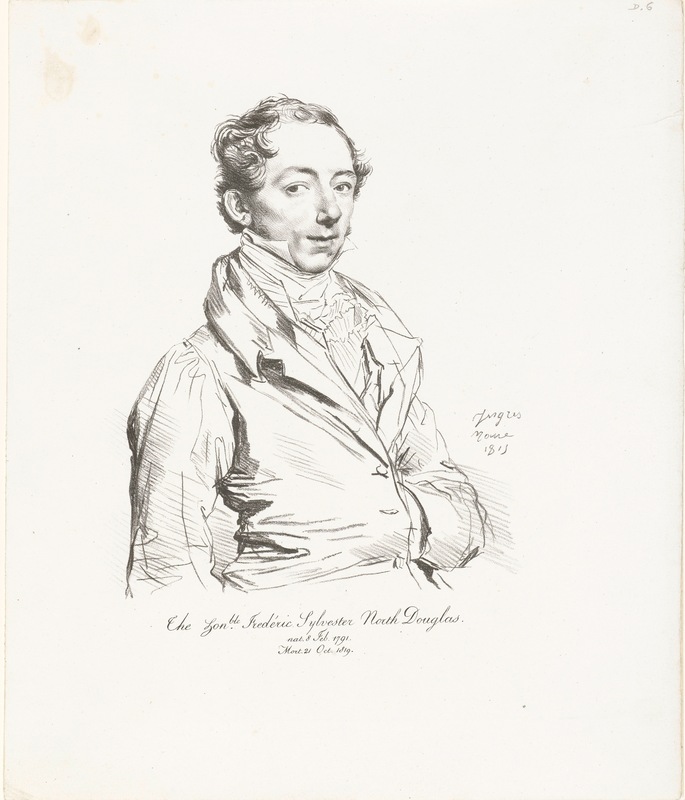 Frederick Sylvester North Douglas (1791-1819), MP for Banbury, classical scholar and admirer of Byron, was on the Grand Tour from 1814 to 1816. This necessary part of the education of a gentleman had been denied to Britons during the almost continuous wars with France from 1793 to 1814. But now, with Napoleon defeated and exiled to the tiny island of Elba, the once invincible Emperor himself had become part of the tour. There are at least three accounts of visits to him on Elba in the manuscript collections of the Bodleian Libraries. 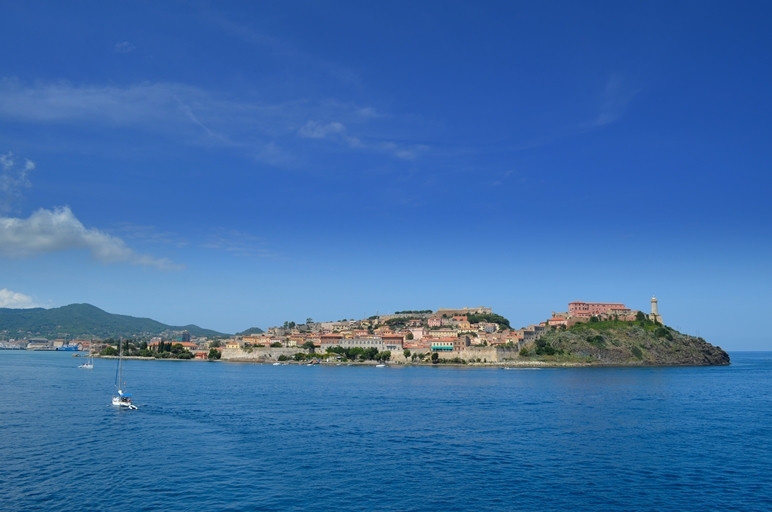 When we awoke after a very quiet night we found ourselves entering Porto Ferraio one of the safest as well as most beautiful in the Mediterranean.… The town itself tho very steep is prettily situated in an amphitheatre upon the port. … The house in which Napoleon has fixed his residence is in the upper part of the town with a fine view of the sea & of every vessel that goes out or in. It is in itself a very simple & I should suppose a small house with nothing to mark the imperial residence. All was extremely simple if not shabby but he was followed by four or five officers & two Polish lancers upon wretched post hacks who were joined by two miserable looking Mamalukes one a black & the other a French man. He was sitting with his hat on but accompanied by an aide de camp who remained all the time uncovered. When Buonaparte saw us he moved his hat & made a bow which Captain Adye thought formal. Buonaparte is not so fat as I expected. He is short & full in the face with a remarkably healthy look. At the same time we saw him he was sulky but his eye was full & clear & there was look [sic] of great sense & intelligence more than of remarkable genius in his countenance. I might I think pass him in the street without looking round. None of the persons I have heard considered as like him are like him at all, Alfred Harris, Lord Wellesley etc, & none of the prints. But the best is that which has the inscription, Adieu Malmaison, particularly in manner. His complexion is brown, but he looks younger than his age. However growing fat must have altered him extremely. Alfred Harris would appear to be Revd the hon. [Thomas] Alfred Harris (son of James Harris 1st earl of Malmesbury) who, like Douglas, was an alumnus of Christ Church, Oxford. 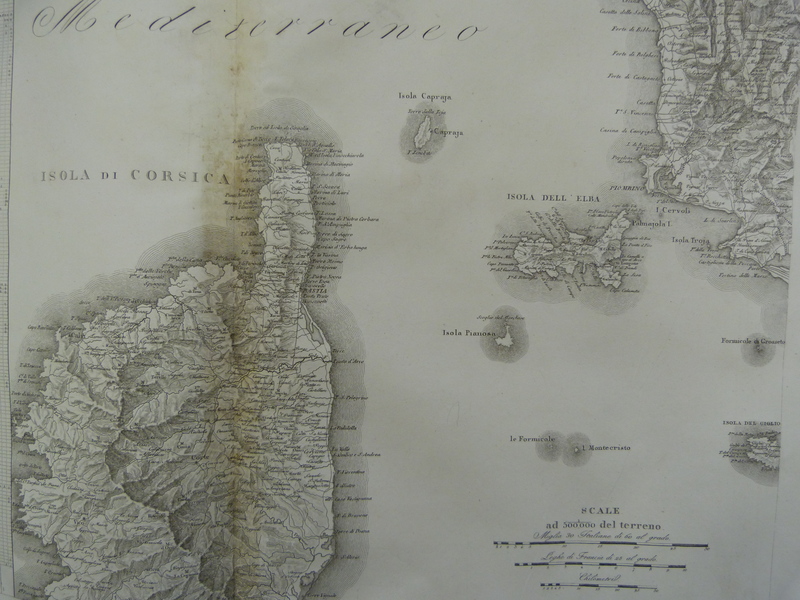 Corsica and Elba, from the Carta Amministrativa del Regno D’Italia (1806). The Kingdom of Italy was created by Napoleon in 1805, with himself as its first king. surprize admiration & compassion to see the simplicity of his tastes … . His retirement & his amusements are certainly those of a great man & an hero. There followed an incident with an officious member of Napoleon’s staff who wished to clear the crowds away from Napoleon’s residence and threatened to use the Polish lancers to do it. Douglas’s military companions took offence, and acting as interpreter Douglas was asked to find out the officer’s name which he eventually gave reluctantly and rudely as ‘Roule’. This must be the Major Roule who had a reputation for officiousness and is mentioned in The journal of Sir Neil Campbell, published as Napoleon at Fontainebleau and Elba (London, 1869). we again saw Buonaparte who was going out in his carriage & who bowed to us with much more civility & with a smile which had something very gracious & attractive in it. His countenance continues to give me what is the idea I had formed of his character, more that of great sense than of genius, of calculation than of greatness. I see no marks of want of amiability in his features but much the look & manner of a gentleman. At last, on Wednesday 16 November Douglas was granted an interview with the great man. He immediately wrote up what he could remember of his conversation in a breathless stream of unpunctuated text, interrupting his usual journal ‘in order to put down Buonaparte’s conversation fresh as it came to my recollection’. I am just returned from a conversation of near an hour with Buonaparte. He first asked me where I came from, where I was going, what place I represented, whether it was a family borough, how the election was conducted, what my father’s name was, whether he was chief of my family, who was, how many Scotch peers there were … . He talked of Milan, asked whether the Milanese were not tired of the Austrians … . Asked who were the principal people in the Ministry & opposition, but seemed to know very little about them. Asked what had become of Lord Sidmouth, whether Grey & Holland were not the head of the Opposition & Burdett. Asked a great deal about our seigniorial rights & did not know they had been all abolished. Wished to know when territorial slavery was abolished & seemed surprized to find it so early. Talked about the Puritans whom he seemed to confound with the Presbyterians. His voice is disagreable & his manner of speaking thick & unintelligible. His manner was however agreable & his look expressed the utmost kindness & civility. He asked the name of our chief families in Scotland & England, wanted to know whether there were not some boroughs in which there was no election – how many nobles, by which he meant landholders, in the house of Commons, how many connexions of the house of peers, talked much about Ireland, & said they had very absurd tenets as Catholics, seemed to wish to change the subject when I had changed it to his wife. Talked much about our way of marrying. Tried to find out [if] we were discontented in Scotland, asked about the dress, knew the 42nd & 94th. … He asked a great deal about Oxford, Cambridge & Edinburgh but seemed perfectly ignorant of everything about either [sic]. Douglas was the son of the Scottish peer and politician, Sylvester Douglas, baron Glenbervie (1743-1823), which explains the Scottish interest. The 42nd and 94th were Scottish regiments. The former, the famous ‘Black Watch’, had fought throughout the Peninsular War, and faced Napoleon again only seven months after this interview. In February 1815 Napoleon made his escape from Elba and began the ‘Hundred Days’ that culminated at Waterloo on 18 June. He said I was not forty yet? He said vous buvez beaucoup [do you drink a lot]? I answered, thinking he meant the Scotch, oui mais pas qu’ autre fois. Le taxe sur le vin l’empeche mais ici vous pouvez boire sans taxe [yes, but not as much as in former times. The tax on wine prevents it, but here you can drink without tax]; when I found he meant me. An interesting perspective on the interview with Napoleon is provided in a letter from Lady Mackintosh to John Whishaw, 22 December 1814, published in The “Pope” of Holland House: Selections from the correspondence of John Whishaw and his friends 1813-1840 (London, 1906).